LAS VEGAS: On Saturday (Sunday Manila time) Filipino ring legend and lawmaker Manny Pacquiao fights for the first time as a 40-year-old. It will be his 70th outing in his 24th year as a prizefighter. The reigning ‘Fighter of the Decade’ and boxing’s only eight-division titleholder is staking his World Boxing Association welterweight crown against bad-mouthed challenger Adrien Broner, a former four-division champ himself. He is fighting for his 22nd world championship appearance. The 29-year-old American title pretender is in his ninth world title stint. This fight will determine whether he, as publicized, indeed, has rediscovered his pinching power, speed and stamina showed in his last assignment against Argentine Lucas Matthysse, who he sent to dreamland in seven rounds, to annex the WBA version of the 147-pound jewel. That came as his first triumph by stoppage since knocking out Miguel Cotto in round 12th in 2009 to win for the first time The World Boxing Organization edition of the welterweight category. This will be his first defense of the plum he took away from Matthysse. While the outcome of Saturday’s Pacquia0o-Broner encounter couldn’t yet be determined, a win by the fighter-turned legislator means a new realm where an extra layer of prestige is achieved not solely by victory but also by the passage of time. Archie Moore, George Foreman and Bernard Hopkins didn't start out to become famous for things they did past their prime, their remarkable late-career success took to challenging mortality. More and more fighters, athletes in other sports, have been campaigning successfully well into their 30s. Not a big deal anymore. But when Foreman won back the heavyweight title in 1994 at age 45, he established a remarkable new milestone. It lasted until 2013, when Hopkins upped the ante by annexing a piece of the light heavyweight title at 48. At his age and his more than two decades of exchanging punches and banging bodies with peers good to be his sons, Manny has already established his legacy no one is capable of duplicating, much more surpass. But why is Pacquiao still fighting? Why he seems to still enjoy training and dancing atop the ring? Those who have been watching him train since pitching camp more than a month ago, observed he never have been happier doing so. 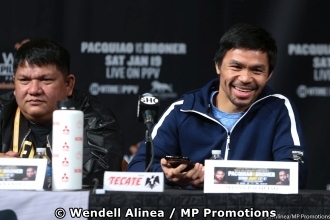 Manny himself answered those questions during Wednesday’s final press conference for Saturday’s showdown. Not, it’s not for money any longer. Nor fame. Nor power. He all has these. “I’m still passionate about the sport of boxing and boxing is my passion. That’s why I’m still here continuing fighting,” Pacquiao told his audience. “I really love boxing and that’s why I’m always excited to fight. Accomplishments, I really have accomplished what I want to attain in life. What I want to do is to maintain and stay at this level,“ he added. “I might sound like a broken record, but all this given by One up there who loves me,” he said. “Not everybody is given this kind of love to make people happy. I fight because in so doing I can make people happy in the only way I can do best – boxing."